Is sponsorship really making a difference? Have you ever been homesick for a place you have never been? I was for nearly three years. 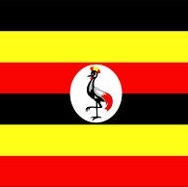 God placed Uganda and its precious people on my heart and I began praying. I prayed for direction, I prayed for wisdom and I prayed for a chance to make a difference. Little did I know where that simple prayer would lead. God began to bring people across my path who had a connection to this beautiful country. I met people at work, church, through family and school and connected to so many networks that had a presence in Uganda. I have a bleeding heart and yearn to help anyone in need, but I wanted clarity. I know I can’t save the world, but wanted to do my part, and I needed something to narrow my focus. And then almost two years later, I met Kelsey through divine appointment. I was intrigued by ROWAN and what it stood for and I wanted to know more. So we met and shared what God had laid on our hearts. She told me about the birth of ROWAN, and Pastor Paul and Mawanga and the great work God was doing in and through His people halfway across the world. I knew I wanted to do something, but it wasn’t immediately apparent what my role might be. So I took the first step and decided to become a sponsor — and that was one of the best decisions of my life. I like to know where my money is going, how it is supporting and setting people up for success. I knew ROWAN would take 100% of my monthly contribution and pour it into the life of a widow or orphan in order to bring hope and supply needs. ROWAN strives to model sustainability and empowers individuals to break the cycle of poverty by providing education and the opportunity to learn valuable skills to equip them for life. ROWAN invests into lives and pours out the love of Jesus into these people by speaking their worth and helping them to achieve their dreams. In some small way, I got to be a part of this incredible journey. Asa’s smile caught my attention the moment I saw her photo and I knew God wanted me to make a difference for her. It started out with me sending a monthly donation to allow her to attend school and have the supplies she needs to complete her studies. I prayed for her, she sent me a letter, I wrote back and longed to actually see her face to face. But I never dreamed I would be able to go to Uganda and meet her. Not only did God allow me that opportunity, but I was able to hold her hands, hear her voice and see that stunning smile. She welcomed me into her home, introduced me to her family and we worshiped together at church the Sunday I was in Mawanga. Nothing could have prepared me for the mixed emotions I felt when I finally saw her. Joy at being able to spend time with her, sorrow for the tragedies she has experienced in her young life and hope for her bright future. She was so happy despite the hardships she faces on a daily basis. If you are in the family of sponsors, you know what its like to receive that colorful piece of card stock covered in stickers and overflowing with excitement. I watched those kids spend so much time and painstaking detail while they wrote out those letters and then copied them onto the cards we eventually received. I saw Asanasi pen the letter that I just discovered in my mailbox earlier this week. She kept looking at me shyly with that incredible smile and then went back to her writing. So I am here to tell you that if you are participating in this endeavor, you are making a difference. I witnessed it and can vouch for the many widows and orphans who shared their stories of hopelessness turned into glorious hope. Be encouraged, and know that your sweet little one, intelligent young adult or tenacious leader has access to a better life because of your sacrifice. But know that this relationship is not one sided, and you can learn from the one whom you sponsor. Asa taught me to never give up on my dreams, to always persevere, to work diligently at any task set before me and to be joyful in hope. So, what about you? Is this something you would like to be involved in more directly? There are widows and orphans waiting to be sponsored — and YOU can be the difference! You’ve heard of them. Various cooperatives that send out monthly subscription boxes. Boxes of beauty samples, organic snacks, wine, coffee, chocolate of the month and even fun activities for kids. I used to receive these monthly missives and loved knowing I would get a small package every month. But I also like to know what I’m supporting; where my money is actually going and whether it is really making a difference. Here’s a subscription box to take notice of if you want to shop with purpose. ROWAN was able to partner with Purpose Box by including one of our best sellers in their latest box: the Antlers For Orphans pendant necklace. The vision of Purpose Box was to create a “subscription box that gives back” by fusing the love of snail mail and desire to make a difference by supporting worthy causes. 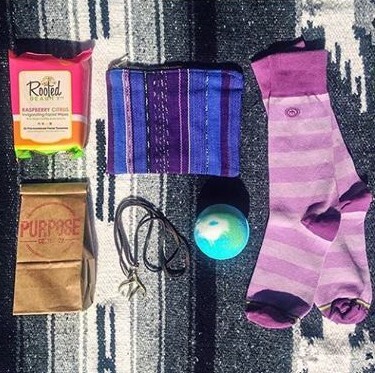 Purpose Box is a bi-monthly mail subscription box filled with purchase with purpose items. Each shipment’s contents are hand-selected and purchased for inclusion in the box. All of the items in the box have their own story, their own purpose. Each box also has a featured purpose. Our inaugural box featured a family from Austin, Texas, pursuing a domestic adoption. All proceeds from the box are donated to the featured purpose. Purpose Box is not a for-profit subscription box. All proceeds are donated. The October box will be supporting Operation Baby Rescue through Leading and Loving It and World Help. The donation from Purpose Box will help with the costs associated with children rescued in Guatemala as they receive medical care and love. We started with a dream, which grew into a plan that is now reality. ROWAN staff learned how to grow passion fruit and make a profit by selling them in the local markets. The next step was to teach others and in doing so empower them to provide for themselves and their families. 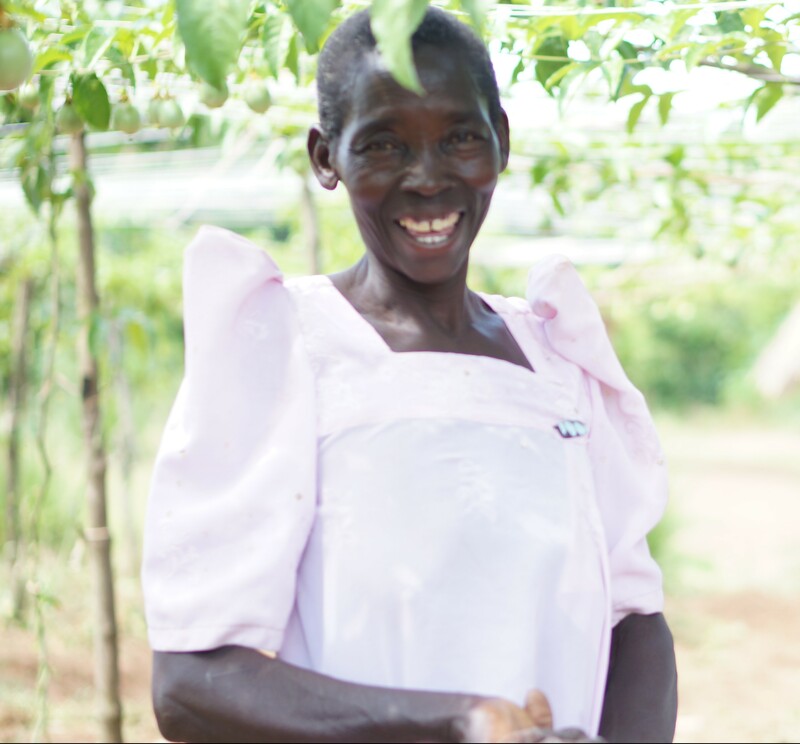 Sarah is one of those women who learned how to grow and care for passion fruit and it has changed her life. She lives with her husband, but takes pride that this is her project. 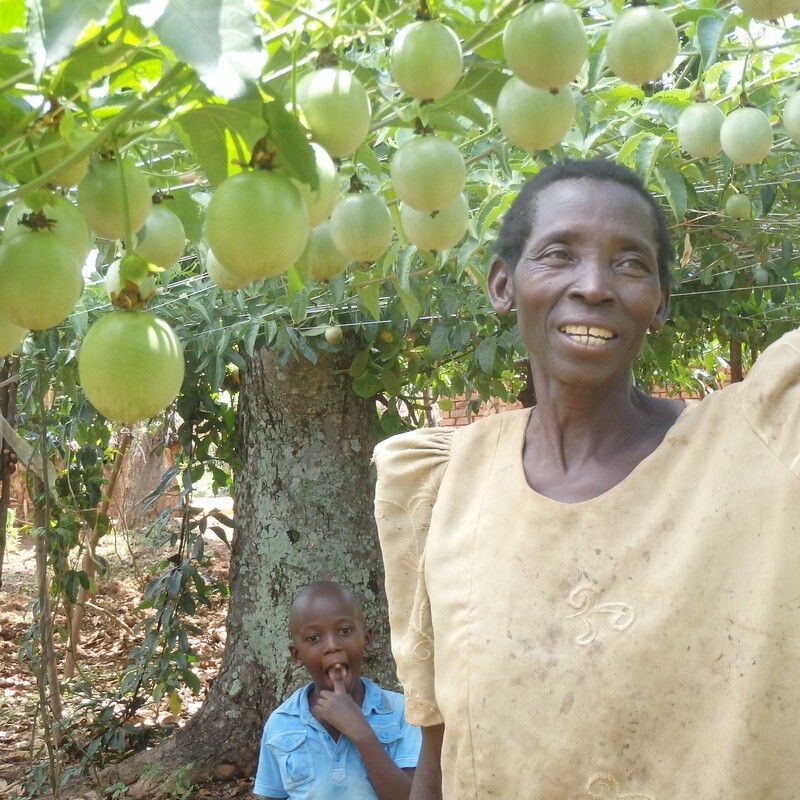 She grows passion fruit to sustain her family and is able to do so because passion fruit is not difficult to maintain. 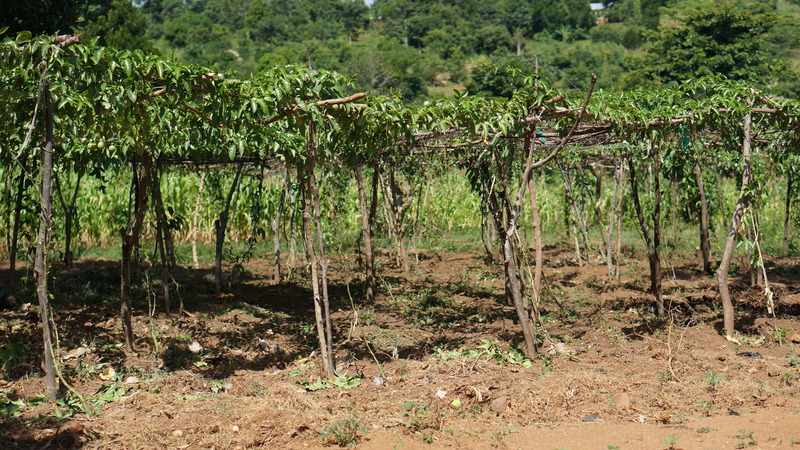 She only has to water and prune the vines in order to ensure they continue to produce fruit. When I was in Uganda , I met Sarah and saw her passion fruit garden. The smile on her face spoke volumes more than any words could ever communicate. She radiated pure joy and was so excited to show us what God has enabled her to do. Sarah is HIV+ but choosing to live positively with the hope of Jesus. Remember these boys and their sweet grandma? Ajuma Winfred is the grandma to Moses, Moses and Moses! 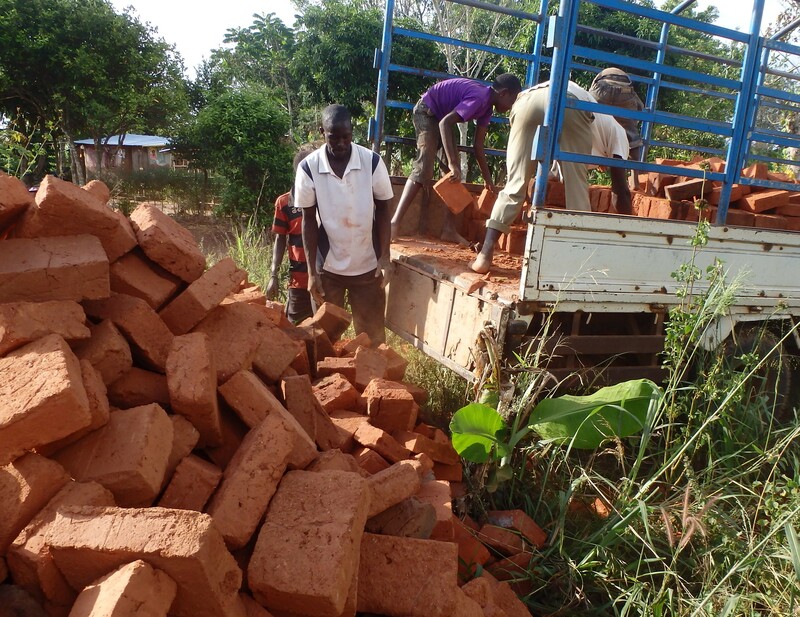 Their house was falling apart and no longer in safe condition to live in. 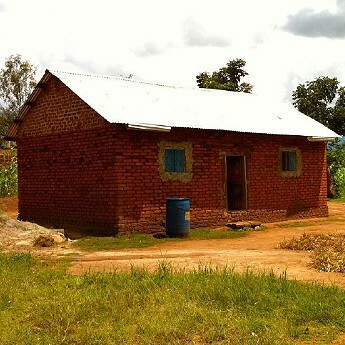 Our sponsors answered the call to action and raised money for materials to build a new house for this family. But it didn’t stop there. Enough funds were donated so that we could give an even greater gift — a plot of land in their names so they have a permanent place to call home. So now, not only do these brothers and their grandmother have a safe place to live, but they no longer have to live in fear that someone will try to take what is rightfully theirs. And that is why ROWAN exists…to be the hands and feet of Jesus and show His love to these precious people in tangible ways. Sustainability: the ability to meet the needs of the present without compromising the ability of future generations to meet their own needs. 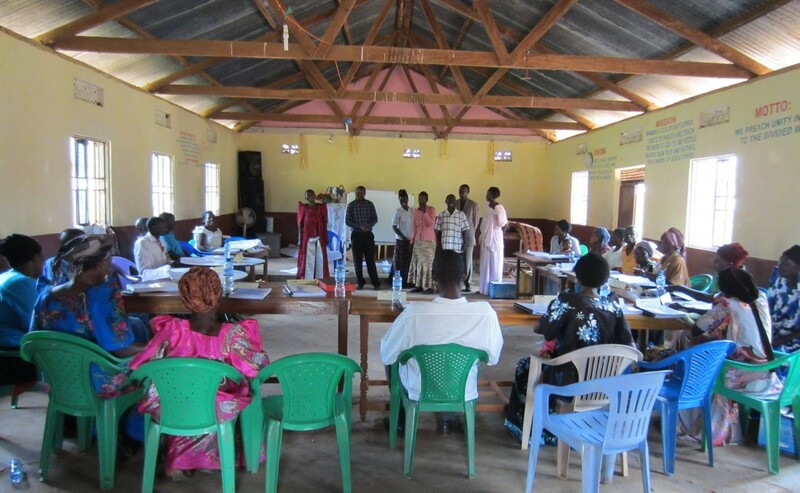 We recently completed a month-long program for business training in Mawanga. The purpose of this training was to equip our people with the necessary knowledge and skills to start and manage their own businesses. Rather than focusing on capital, which is hard to come by in many of these rural communities, we looked at the assets these people already have and how they can develop them into a way of generating revenue and earning a steady income. 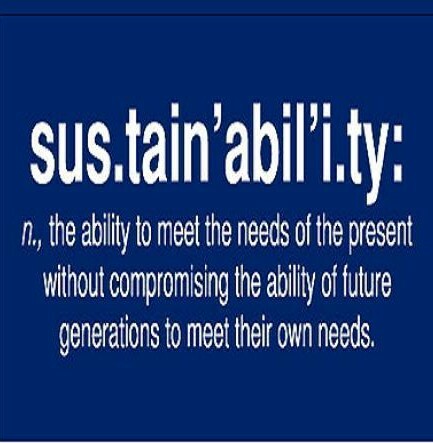 The ultimate goal is to work towards this idea of sustainability. 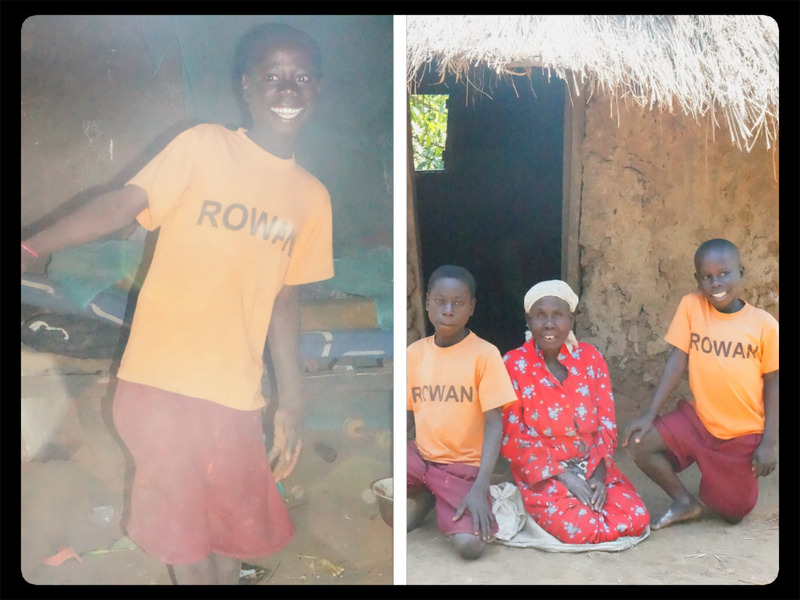 While ROWAN strives to meet urgent needs and take care of their own, what we really desire is to see these individuals succeed and be able to provide for themselves and their families. We want to empower them and encourage them to follow their dreams, and we can learn from their tenacity of spirit. Western culture coming in and attempting to rescue those struggling in the face of poverty isn’t the answer. Rather, we must work together and learn from one another. Giving support by helping our people bring life to their business ideas and letting them take pride in ownership is so much more effective. This is what will change the future and how Africa is perceived by much of the world. So, while much of ROWAN’s ministry does deal with meeting needs, we want it to be more about building relationships and coming alongside to empower and encourage. Knowing where the needs are is important, but even more vital to survival is the ability to eventually be self-supporting. And establishing businesses has the potential to do just that. Even Pastor Paul is now making cakes as a business. The next step is to continue to follow up on a monthly basis to assure that each business owner is successful. …Many ministries do begin this way, conducting a “needs assessment” by using and interview or a survey to determine what is wrong and the best way to provide assistance. This “needs-based” approach has merit, for diagnosing the underlying problems is essential to formulating the proper solutions. However, starting with a focus on needs amounts to starting a relationship with low-income people by asking them, “What is wrong with you? How can I fix you?” Given the nature of most poverty, it is difficult to imagine more harmful questions to both low-income people and to ourselves! Staring with such questions initiates the very dynamic that we need to avoid, a dynamic that confirms the feelings that we are superior, that they are inferior, and that they need us to fix them. What are people saying about ROWAN? Just for fun, I thought I would post a few recent reviews on ROWAN. The reason we excel is because God is in this work and continues to transform lives through this ministry, both here and across the ocean. So here are a few different perspectives about us. We can’t do it without God and we wouldn’t be able to function without you! Thank you for being a part of this team and working together with us to make a difference. I had the opportunity to volunteer with ROWAN in Uganda last summer of 2014. It was honestly the most eye opening and uplifting missions trip/volunteer trip that I have been on. Hearing from the villagers about how ROWAN has positively impacted them, their families, the village of Mawanga, and the surrounding villages was inspiring and heartwarming. 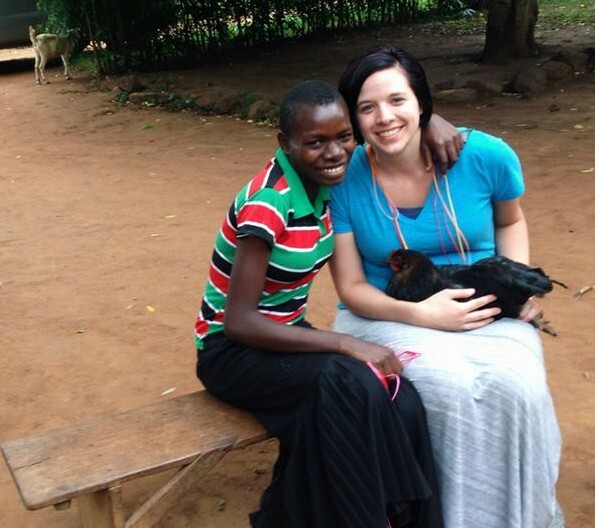 The work of ROWAN, in the US and in Uganda, is truly changing lives and the power of God can be greatly seen at work. I cannot wait to return to the village someday and visit the friends I have made. ROWAN is a genuine organization that I look forward to following the growth of! Please, if you haven’t heard of ROWAN before, make sure to check out this organization. From helping widows and orphans to empowering communities, ROWAN is all-encompassing. ROWAN is an ministry that is glorifying the Lord in every thing they do! They are loving people, loving God, accepting the poor, hurting, lost and building the Kingdom of God. I have been with this ministry for 4 years now and I’ve had the pleasure of watching it grow, impact lives, and change the face of ministry forever. God is moving in miraculous ways; the lead team and everyone involved keeps God at the forefront, always going to him in prayer– and impossible things are made possible because of FAITH. Kelsey, the co-founder and Pastor Paul are a force to be reckoned with, God is using them in mighty ways. I recently started sponsoring a child (newborn to be exact) and I have to say it’s one of the most rewarding things I’ve been a part of. My husband and I are truly blessed and thankful to walk in ministry with ROWAN!